God, I hate January. I'm sorry but I do. It's dark and cold and feels literally endless. There's even the cheek that there's 31 days in it not 30 and we all know that makes ALL the difference, right? (Perhaps that's just me???). Also, the snow. I don't like snow. Pretty but treacherous, that's how I feel about snow. Anyway, I for one am glad that tomorrow is February but I thought I'd just do a little review of what's been going on in January, in a few bullet points just to pull it all together and make it feel like it wasn't just one long round of getting up in the cold and dark. The taste of Chunky Chocolate Slim Fast shake with extra protein. All the family birthdays we've had (3) in January. Going on two dates with my husband and having an actual conversation and one of them did not involve the kids! Getting back into exercise, walking more and keeping an eye on my fit bit. Using my slow cooker. I've had it ages and only just started to use it. Wish I'd done it before - so easy and the kids love it! Saying "blow your nose" and "use a tissue" and "wash your hands I don't want your germs" to my kids for the entire month. There has not been a single day where we have all been fully well. Mopping the kitchen floor every five minutes because the dog is always out barking at rabbits and then comes back in and makes a lovely little paw print trail on my kitchen tiles! Writing my essay on child attachment for my OU course and submitting it before the deadline. Ignoring the cupboard full of Christmas chocolate. Seeing a really nice pair of sandals in Marks & Spencer and not buying them because I DON'T NEED THEM IN JANUARY!!! My eldest son's first podcast. Writing more than four blog posts in 31 days. Given that I only wrote four in 365 days last year ... oops. Several lip balms (including Nivea, Carmex and Burt's Bees - reviews to follow). A nice green jumper from Long Tall Sally. A replacement dishwasher for the one that went kaput before Christmas. As I type, the temperature has dropped to minus 1, hopefully by the February review it will at least be attempting to warm up a bit! I can take or leave traditional lip balms usually. You know those ones that are like a chapstick? Regardless of brand I tend to find them sticky and heavy and I rarely ever finish them. I think maybe the only ones recently that I've liked a lot are the Maybelline Baby Lips ones from a couple of years ago. I have to say I've had something of a spree on lip balms recently having invested in one from Nivea and a Carmex tinted one so no doubt these will be popping up on the blog some time soon. You can never have too many lip balms in my opinion, considering how easy they are to get lost - coat pockets, bottom of handbags, little change tray in the car ... you know what I mean. That's why more than one on the go at any time is essential for me! ... this is a review on Burt's Bees Tinted Lip Shine. I have to admit that I do like this one a lot. The colour is 'Pomegranate' which is a reddish colour. It sort of tints the lips and gives a shine but also seems to give quite a lot of colour at the same time which I found impressive and a good choice if you want a balm that makes it look like you're wearing a lipstick. I've been testing it for a few days because you can never really tell first off if it's going to be good not. It does last quite a long time but obviously as it's a lip balm it's easy to reapply without a mirror on the go so it wouldn't matter if it didn't have staying power really. It didn't seem to smudge all over cups etc, like usual lipsticks do and it also didn't bleed into the little lines round my mouth (result!). It also leaves my lips super soft which is really essential this week with the weather suddenly getting very cold, the extremes of temperature between outdoors and indoors is huge and that's when my skin starts to have a crisis and dry out. I've also got Burt's Bees 'Red Dahlia' tinted lip balm which I'll photograph and do a quick separate post on, it's more of a pale red rather than brown/red like this one. I've just checked, they don't seem to have an SPF in them but these would look great in the summer too I think, with a few freckles/tan and a bit of bronzer, definitely a product that can be used all year round. So today is Blue Monday, that is, the day in the month where we are all feeling yuck and poor, we want to ditch all our New Years resolutions and eat, drink, smoke and wave bye-bye to our new gym subscriptions because it's all Just Too Hard in January! Hats off to anyone doing Dry January, keep going only 10 more days! Anyway I quite often feel like this I don't need a specific day in the month to feel blue. And it's not necessarily hormonal either, some days are just really hard and I feel bleurrgh. I actually feel ok today, I mean it's Monday, it's cold and it's dark but that's just January isn't it? I've been thinking all day of things that I've got to look forward to and I thought I'd share them incase they inspire you too. Here is a picture of my daffodils, I bought them in M&S last week and they only took a day to come out, such is the power of my central heating. I love yellow and I love flowers and they make me feel happy so I've spent all week looking at them and thinking how lovely it will be when the flowers come out. That does sound a bit soft but when you're down these little things make all the difference don't they? My beautiful dog. He's always good for a cuddle even though he drives me crazy with his mucky paws and whinging to go out all the time to bark at the pigeons/rabbits in the garden. If you've got a pet, give them a hug or a stroke, it works wonders for the blues and I love mine to bits. British Summer Time is basically noted in my diary as "Clocks" meaning the clocks go whichever way they need to move in order to give me an extra hour and enable me to get up in the morning in the light and make my evenings lighter and therefore my mood will also be lighter as will the bathroom scales as I am always heavier in Winter. I love the "Clocks", thank you very much. Only 68 days to go. By sales I mean the sales are over (or almost) which means that very soon the shops will be full of sandals and summer wear. Obviously it will be completely useless to us because we're still going to be freezing our butts off for another couple of months (ha, we WISH it was only a couple ☁ ☂) but even so, it makes us think of summer and holidays and sun cream and that's a really nice happy thought. So, yay to the strappy dresses and flip flops even if we can't wear them yet. Obviously if you get hay fever for months as half my family do the Spring and Summer are a double edged sword but at least it's not dark! I'm currently on my first module of an Open University degree. I started in October for two reasons, firstly to challenge myself as it's been a long time since I studied at that level and I wasn't sure I could do it, and secondly to learn something completely different. So I'm doing Psychology. It's really interesting but it's not easy as you'd expect. So while I do wake up at 3am sweating slightly at the thought of juggling my academic reading and essays with the kids and everything else I'm still pleased that I'm doing it and looking forward to achieving something. Also it's part-time so I will be finished in May, the next module starts in October. Yes, as you know they are reuniting, almost - Posh Beckham has decided to stick to her new clothes designer career which is fine. But I'm super excited because my sister and I are going to see them in Manchester doing their first gig for a long time. I can't wait! Zig a Zig ah! I'm so interested to see how they've changed. I'm literally the same age as them so I can't help wondering what they will look like and how they'll sound. That's it for Blue Monday, don't worry it's Tuesday tomorrow! This week I've been really tired. Actually I'm tired all the time, January saps me of all my energy, I can't sleep properly, my skin is pale and I've got a recurring sinus infection too which means I've got a tissue stuffed up my nose most of the time. How lovely! What I would really like to do is get on a plane and fly to much sunnier climes for a couple of weeks, just to get a bit of vitamin D and grow some freckles. 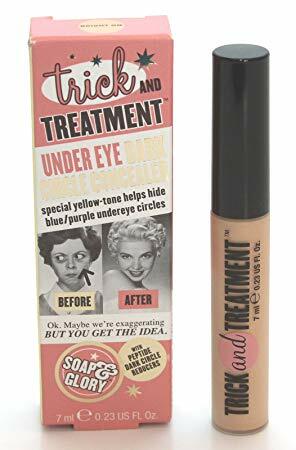 Unfortunately this is not going to happen anytime soon so in the meantime I have been trying a few things out to make my tired face look a bit more awake in the mornings and to cover up the purply rings under my eyes. I don't usually suffer with dark eyes, I think the sinus infection is to blame for that! Obviously, I've been using my trusty Clinique 72 hour moisture surge moisturiser (which is so good it deserves a post all by itself, I will do this) but I've also been using two other products, the Too Faced Hangover primer and a Soap and Glory concealer round my eyes. I'm the queen of primers, I have many and I use them all. I wouldn't go without one as they really do work for me in terms of making my skin look and feel better and it makes my foundation stay on better as well. Well this is just lovely. It smells like coconut (because it's partly made out of coconut water) so that's brill as I love the smell. It's also quite a thin consistency so it sinks into the skin very quickly and gives a sort of cooling feeling. It's got probiotics for the skin in it as well, I think this is what the "perking up" ingredients may be because once I've put it on my face definitely looks a lot better. I got this from Debenhams beauty department but you can also get it online. If you click the link it'll take you straight through to the product. 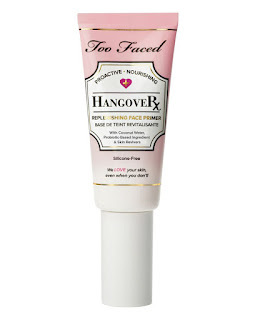 There is also a Hangover spray but I haven't tried that yet. So that's the face sorted, next it's onto the eyes. I've always been very happy with anything I've bought from Soap & Glory, it's not just the cute packaging I like, it's the products. I've never had anything I've been disappointed with and I think it's really reasonably priced as well. 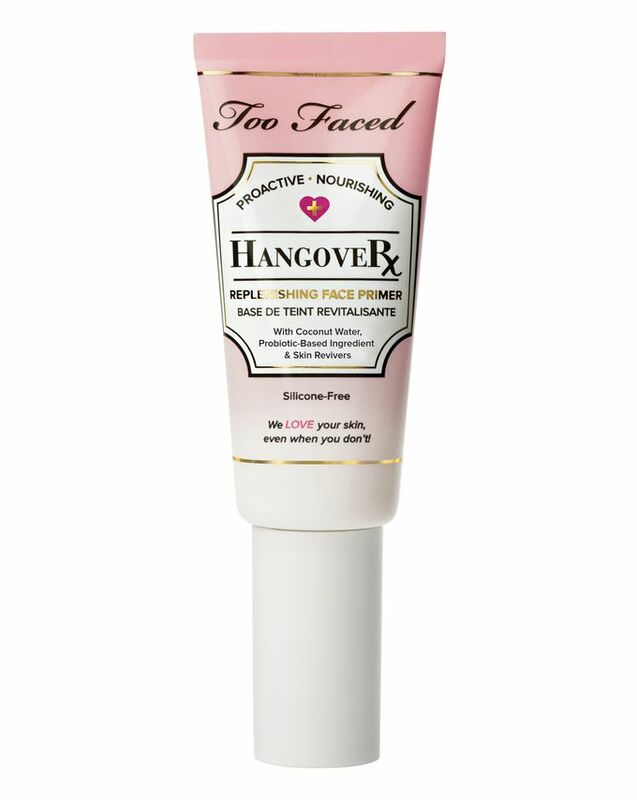 This product is an under eye concealer dedicated to banishing those dark circles (purple in my case). any. I don't know if they do more than one colour but the colour I got was called Bright On. Photo below of me and my littlest boy on Monday morning, broad daylight having done make up under artificial light (I told you I hate January). I am wearing both products, believe me the purple circles were worse before (no filter! ).